Before dinner, Mike Geary starts the introductions. 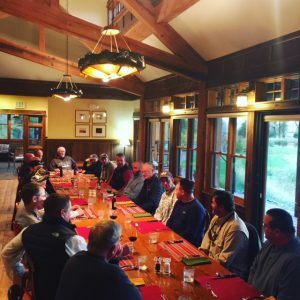 Six honored guests sent to us from Project Healing Waters Fly Fishing, 9 generous guests associated with Weiland Build, Lodge icons Tom R., Steve M., and Tobie M., are mixed in there somewhere. All are here for a rainy few days of fishing and some comradery with those who served.